Parenting is not only restricted to humans. It is not hard to imagine among the animals. When parents scold us, they try to make us learn about something. Parents want us to learn something always. Especially when we are young, we have to go through a lot of lessons. Our parents scold us and punish us but all that is worth. We become better individuals in life thinking about the good things we have learned from our parents. At first, it looks like we don’t want our parents to be harsh. But as we grow up, we see the reason why we have been subjected to all of that. Very similar to us are animals. Adult animals who have their young ones want them to learn lessons too. They want them to learn the things they have learned from their parents. In this video, we see a similar thing. A baby gorilla named Shufai was having a great time playing. He lives at the zoo with his family. 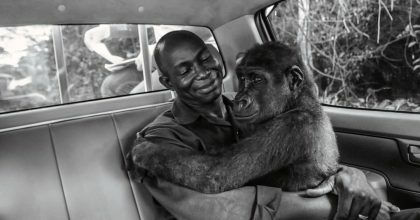 He was busy playing with tree branches when he was stopped by his father, Oumbi. This is at Twycross Zoo where the incident took place. The father gorilla was seen taking away the tree branches from the baby. The visitors at the zoo couldn’t really understand what was going on until they watched for long. Actually the father was trying to teach the baby gorilla to save their food. The tree branches were their food which they shouldn’t waste by playing. The baby gorilla understood his father’s teaching. The visitors too saw some very good quality animal parenting! Daddy steps forward to save his little puppy.